VALENCIA, Spain – Ships in the Aquarius aid convoy docked Sunday at the Spanish port of Valencia, ending a weeklong ordeal for hundreds of people who were rescued from the perilous Mediterranean only to become the latest pawn in Europe’s battle over immigration. After days of bickering and food and water running low on the ship, Spain stepped in and granted the rescue boat entry. The 930-mile journey across the Mediterranean from Sicily to Valencia took nearly a week. David Noguera, the head of Doctors Without Borders in Spain, said he was glad that Spain allowed the migrants in but he’s worried that more European nations will close their ports to those rescued at sea in the future. The migrants were met by emergency workers, health officials, Red Cross volunteers and psychologists at the city’s marina. Each were assigned to a translator and authorities worked to determine their identities before they were sent to welcome centers. The first migrant was a 29-year-old man from South Sudan. “We have to strike a balance between our sensibilities and humanity and our respect for the law,” said Spain’s migration minister, Magdalena Valerio. Under the EU’s asylum laws – currently the subject of a major political dispute and under revision – migrants must apply for asylum in the country where they first enter Europe. In practice, the policy has placed a heavy burden on Italy and Greece, where hundreds of thousands of asylum-seekers have arrived in recent years. Spain’s new Socialist government has taken up the cause of the migrants to demonstrate its commitment to protecting human rights. But overall, the European Union’s 28 members have not agreed in the least how to handle the influx of refugees and migrants to Europe. The issue has put strong domestic pressure on German Chancellor Angela Merkel, created a spat between France and Italy, and prompted eastern nations like Hungary and Poland to refuse to take in any migrants. Immigration will be a top issue at the EU leaders’ June 28-29 summit. In addition, a new populist government in Italy – one whose interior minister has vowed to deport tens of thousands of migrants as soon as he can – will make any compromises on EU migration policy even more difficult. The warmer weather has caused a spike in migrants taking off from North Africa for Europe. 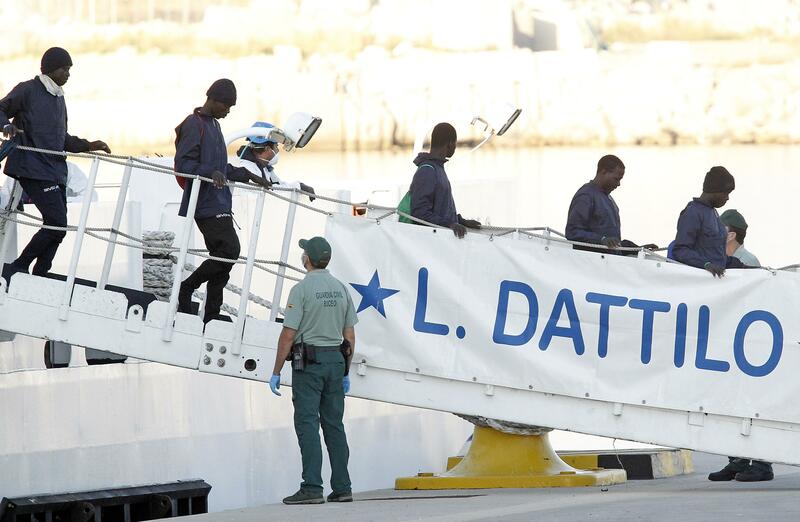 Spain’s maritime rescue service pulled 986 people from 69 small smuggling boats near the Strait of Gibraltar between Friday and Saturday, and also recovered four bodies. Published: June 17, 2018, 8:45 a.m.